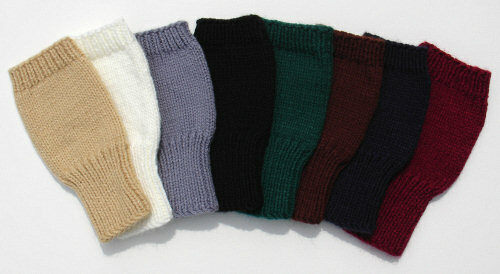 Classic knitted mittens are always a favorite, but they make it difficult to do so many things. 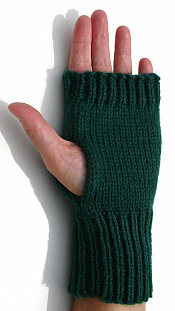 This fingerless design will help keep your hands warmer while allowing full use. Think how much easier it will be to use your cell phone, load your groceries, drive your car, and unlock the house with your thumb and fingers free! These mittens have a ribbed cuff to keep the cold wind out, and a ribbed edge at the fingers to hold the mitten close to your hand. There is a simple hole for the thumb, so it has complete freedom of movement. I typically knit these with acrylic so they can be machine washed and dried. However, I'd be happy to knit them in wool if you'd like a little extra warmth, and don't mind washing them by hand. 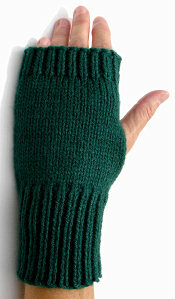 While fingerless mittens offer obvious benefits for the outdoors, some people wear them indoors as well. I find that my hands get very cold when I'm working on the computer. I pull on a pair of these and then I can work much more comfortably. Put a pair in every family member’s Christmas stocking. They are a gift that will be used again and again! For a matched gift set, combine the knitted fingerless mittens with a Knit Beanie Hat or Knit Beret, or even a Knitted Headband.